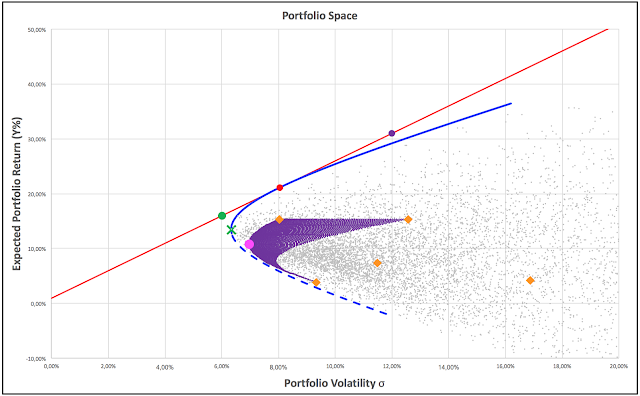 In the above risk-return graph the portfolio space is plotted for every unconstrained long/short portfolio of 5 ETFs: SPY, EWJ, VGK, EEM, and DBC, with portfolio weights summed to 100%. All feasible long/short combinations are contained by the blue portfolio envelop hyperbola, with the efficient frontier being the solid upper boundary and the inefficient frontier the dashed lower one. The grey dots represent 10,000 random unconstrained long/short portfolios. The well-known minimum variance portfolio (MVP) is located at the green cross-mark, being the portfolio with the lowest risk; every single other portfolio combination will result in higher risk. 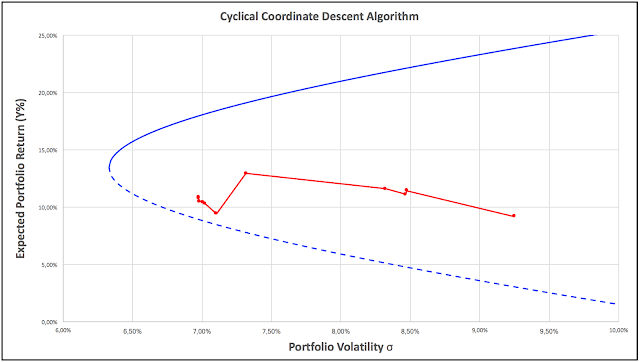 The so-called tangency portfolio (TP) is situated at the red tangent point where the capital allocation line (also in red; basis: 1% risk free rate) touches to the efficient frontier. The TP is suggested to be the mathematical optimal non-leveraged portfolio under the mean variance framework (in the continuation of the video Arif Irfanullah discusses the TP too). On the same capital allocation line, but outside the portfolio envelop, are two particular portfolios depicted. This are two portfolio combinations of the five mentioned ETFs along with a separate risk-free asset: the green dot showing the portfolio with reserved or saved capital and the purple dot the one with borrowed capital (leverage), with target volatilities of 6% and 12%, respectively. With the long only constraint imposed, each of the orange diamonds depicts a 100% holding in one of the five ETFs, and the purple hurricane shaped cloud represents 5,151 long only portfolios consisting of SPY, EWJ, and DBC (with 1% sized steps). As stated, the long only minimum variance portfolio is to be found at the magenta dot on the outer left side of the purple portfolio cloud. Under the long only constraint, the weights for VGK and EEM are fixed at 0% in order to reach minimal risk (shorting is prohibited). Hence the 3 asset purple portfolio cloud. In the remainder of this contribution the localization and characteristics of this special case portfolio will be assessed. 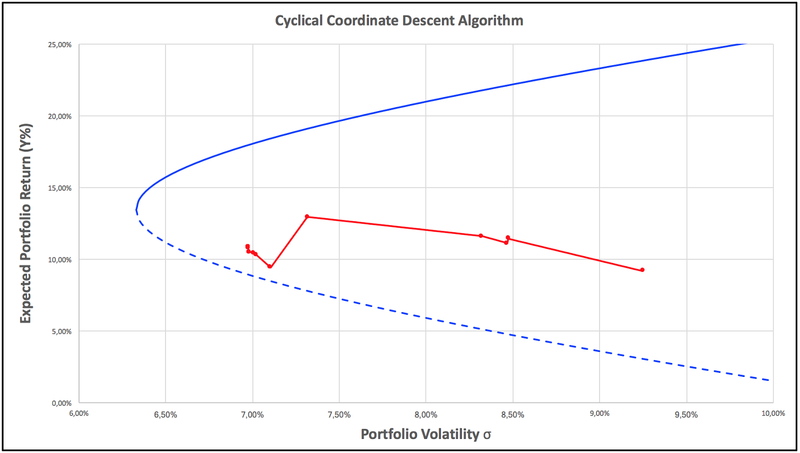 As stated, the MPT framework relies on estimates for returns, volatilities, and correlations. Since these estimates are notoriously difficult to predict, especially with regard to the future, a tactical timeframe is adopted for the necessary calculations using a heuristically composed diversified investment universe like the one proposed by the InvestReSolve team (formerly Gestaltu) in their AAA-primer: SPY, VGK, EWJ, EEM, VNQ, RWX, DBC, GLD, TLT, and IEF (see also end notes below). For starters, each month the best 5 out of 10 ETFs are selected based on their 126-day momentum. Next the minimum variance portfolio is determined as the optimal mix of these five ETFs for obtaining the lowest possible risk (=volatility), using the following steps. where w is the weights vector with sum equal to 100% and w(i) ≥ 0 and ∑ equals the covariance matrix. To establish the weight combination that satisfies the minimum variance σ2 objective, a Cyclical Coordinate Descent algorithm is deployed (see end notes for sources). For a preset number of cycles, the CCD algo iterates through the weight combinations, approaching closer to the minimum variance objective with each cycle. In the following graph the red zigzag line paints these iterations going from right to left, minimizing portfolio volatility σ. By selecting only the best 5 out of 10 assets, AAA is capable of detecting momentum based trend changes. In up-trending markets capital is allocated into offensive assets, like stocks, REITs, and commodities, while during market sell-offs especially intermediate US-treasuries are in vogue. The following diagram shows the allocation transformations during the bear-bull cycles since the turn of the millennium. Notice the waxing of IEF in periods of market stress (shown for the native InvestResolve universe). The following charts provide a detailed view on AAA’s end-of-month performance using AmiBroker as backtest platform. For this demonstration an alternative investment universe is deployed: SPY, QQQ, IWM, EFA, EEM, VNQ, RWX, DBC, TLT, and IEF. By substituting VGK, EWJ, and GLD with QQQ, IWM, and EFA the universe at hand is tilted toward domestic US assets, while at the same time demonstrating GLD is not per se required to reach sufficient diversification. NB! Results are derived from simulated daily total return data. Furthermore, trading costs, slippage, and taxes are disregarded. Results are therefore purely hypothetical. Past performance is no guarantee of future results. NB! No guarantee whatsoever is given for the soundness of the strategy nor the proper functioning of the table nor for the accuracy of the signals. Please do your own due diligence and use at your peril. The Important Notice in the footer applies as well as the Disclaimer. The signals for the Adaptive Asset Allocation strategy will be added to the Strategy Signals page shortly. The native InvestResolve universe is tracked by AllocateSmartly. Their AAA-post offers additional information along with an extended backtest. The AAA-primer by the InvestResolve team and their AAA-book are recommended readings. Mathematically inclined readers may find the treatise interesting on the CCD algorithm in appendix A.2 of this Smart Beta paper by two other French quants, Jean-Charles Richard and Thierry Roncalli. The AAA strategy is published on Seeking Alpha too, featuring the native InvestReSolve / AllocateSmartly investment universe with 10 global asset classes.